Llanbedr-y-cennin lies on the river Conwy, close to the site of the old Roman fort of Caerhun and under the shadow of the impressive Iron Age hill fort of Pen y Gaer. The settlement lies on the slope of a steep hill, with the church of St Peter at the higher end of the village. The Open Doors information from Conwy BC states that St Peter’s Church was established in the thirteenth century on the site of an earlier “cell” built near two curative wells. I haven’t been able to trace their reference for this detail. Llanbedyrcellin well. 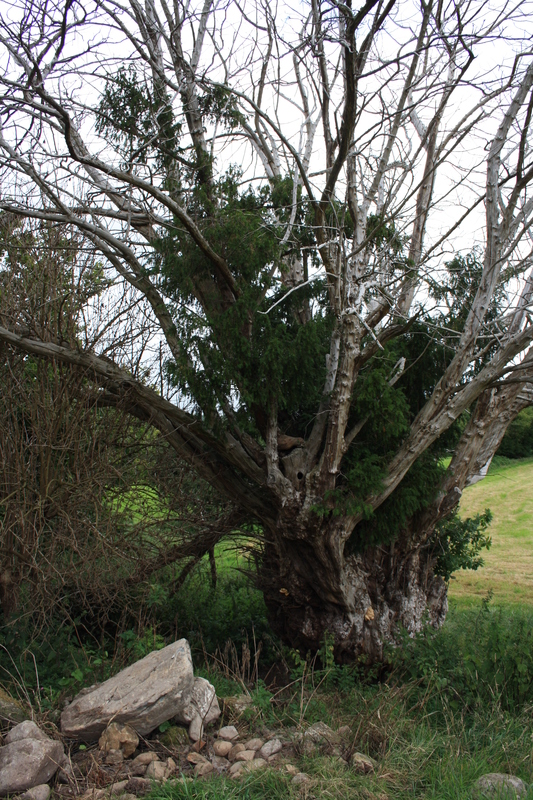 Near the church – curative – a yew tree grew above it. It was covered by a little building, now ruined some 10 feet by 9 and a half feet. The well itself being 6 feet by 4 feet and 3 feet deep. About 60 years ago sick children were bathed there and afterwards carried to a little chapel nearby which had disappeared before 1906. Ffynnon Bedr (St Peter’s Well) is about a quarter of a mile south of Llanbedrycennin. It is overshadowed by a yew. It was once covered by a building10 feet 9 inches by 6 feet. Up to about 1844 children were bathed there and afterwards taken to a little chapel outside the cottage garden. The immediate reaction is to the similarity between the two descriptions. I’m sure there never were ever two wells with such similar properties, but has the description of one found its way to being applied to a second well or was there only ever a single well whose location has been misinterpreted at some stage? 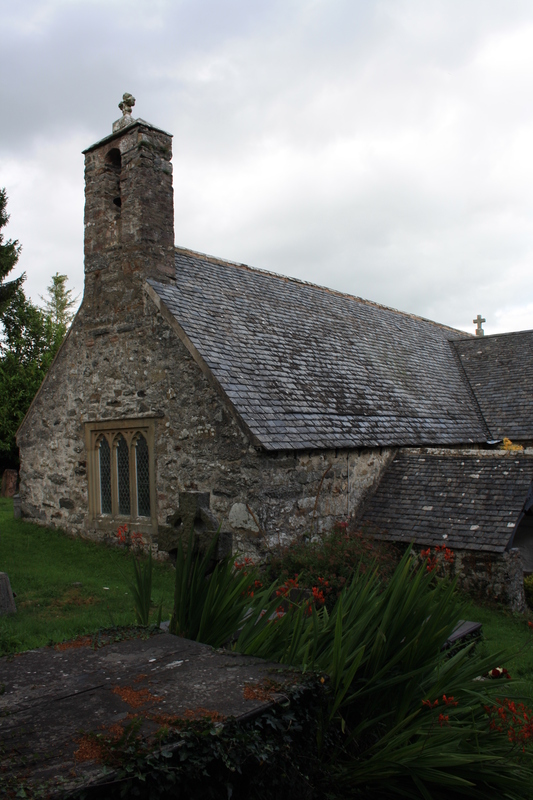 The sources cited by Jones for the two wells were two volumes by H L North, Old Churches of Arlechwedd and Old Churches of Snowdonia  themselves printed 20 years apart at the start of the twentieth century. I suppose it may be down to Mr North himself confusing two stories and failing to check his back catalogue before racing back into print, although probably more likely is that Jones himself, and not for the first time, failed to cross reference in his own gazeteer. A rectangular hollow 10feet by at least 14 feet, axis NE – SW, surrounded by a masonry revetment destroyed on the NE. Water enters through an opening on the SE side. The cottage of this name lies 150 yards to the S.
The buildings around the well began to decay towards the end of the 18th century although usage continued up until the 1850s. 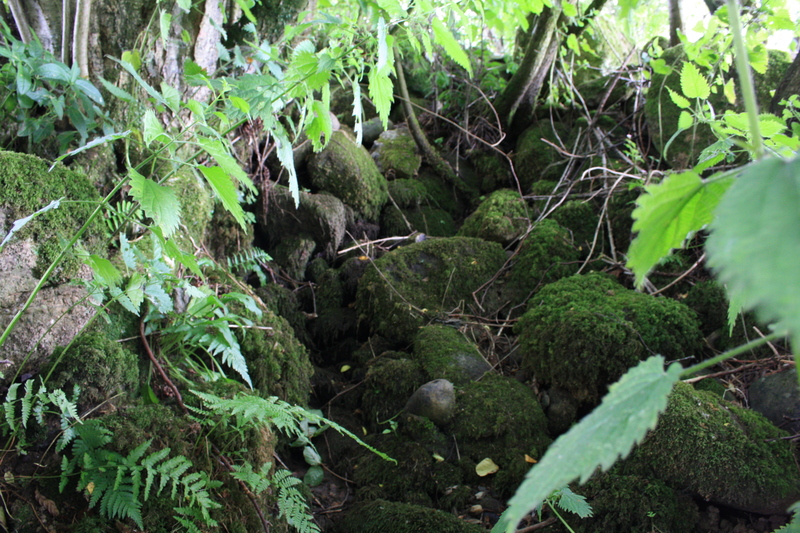 At the turn of the twentieth century walls could still be seen Water flowed through the well, joining a small stream that runs along the nearby field boundary. It is believed the well was largely destroyed around the end of the First World War, when the farmer seeking to stop the flow of water, filled up the well with earth and large stones. 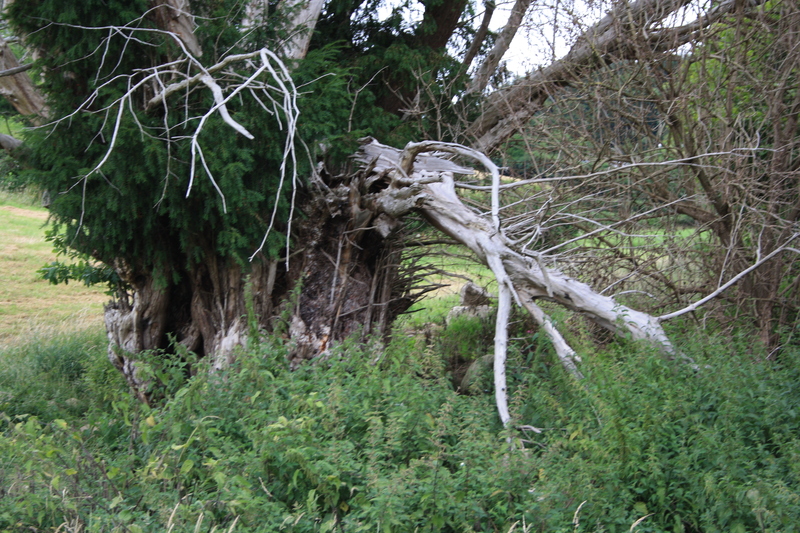 The interruption of the well affected the health of the yew tree and there were fears that it was dying at some periods. A public footpath starting close to the old shop leads across the fields to the well. It wasn’t the best time of year to go visiting the well. Nettles grew waist high all across the site, and it was difficult to make out anything more than the jumble of large stones in the area. With a little stretch of the imagination it was possible to interpret them as a rectangular enclosure, though clearly nothing remains of the well itself, and I wasn’t able to identify any signs of the spring. In around 2003 members of Cymdeithas Ffynhonnau Cymru carried out work on the well to try to unblock the spring and restore water to the tree. A number of large boulders were removed from around the tree at that time, and it was noticed that the ground at the base of the tree was wet despite the lack of rain. The tree now appears to be thriving once again, although the outside appears dead, there are new shoots growing on the inside. Ffynnon Bedr cottage, near which reputedly stood the well chapel, remains today. The oldest parts date from the sixteenth century or earlier. Its main claim to fame these days is that it was once the home of the celebrated school story author Angela Brazil, who lived there for around 20 years, around about the time at which the well was being filled in. The contrast between winter and summer pictures below shows the extent to which any features are hidden for much of the year, but even when the weeds die down there is little other than heaps of stone to mark the site. Thus, whilst the decline and decay of Ffynnon Bedr has been relatively well documented, Llanbedr well, if it ever existed as a separate entity, has silently vanished away. 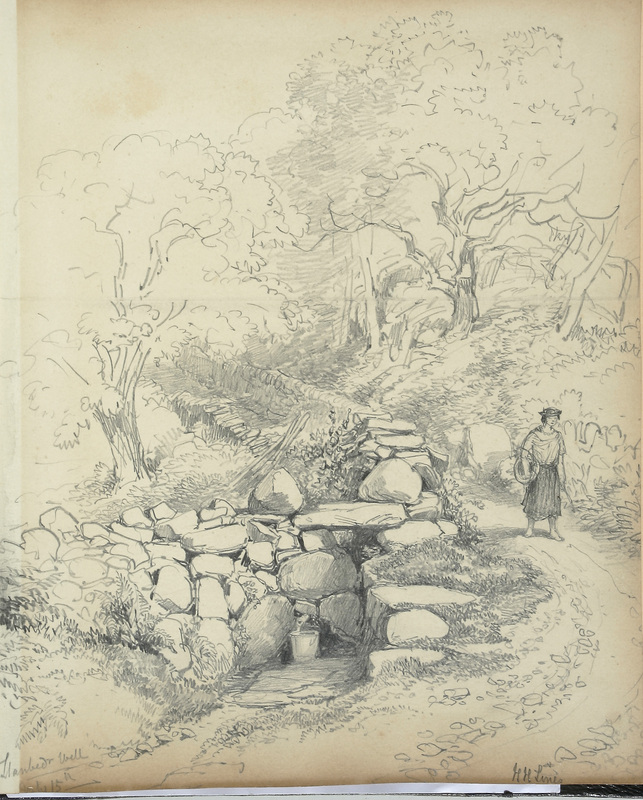 There remains one drawing, a preliminary sketch for a painting entitled The Village Well exhibited in the 1870s by artist Henry Harris Lines, at the time when the area was occupied by a small artists’ colony. The title of the sketch is Llanbedr Well. 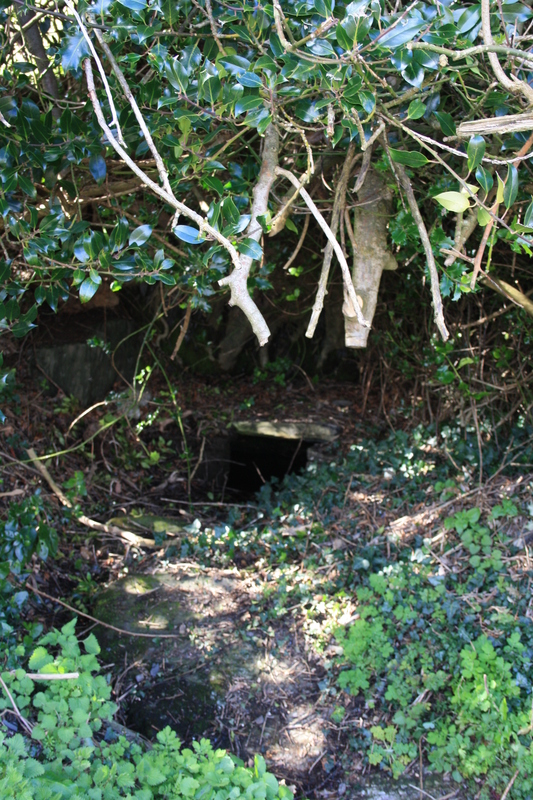 Examining the lie of the land, the route the footpath takes and the absence of a prominent yew tree, there has either been some huge degree of artistic licence used, or this is indeed an illustration of the second well, Llanbedr well, on the lane rising up the hill to the north of the church. So – one well or two? I tend to believe that the well Harris drew was just a village water source rather than a holy well. Returning in the winter of 2014 I walked up the hill from the church and found the water source below. 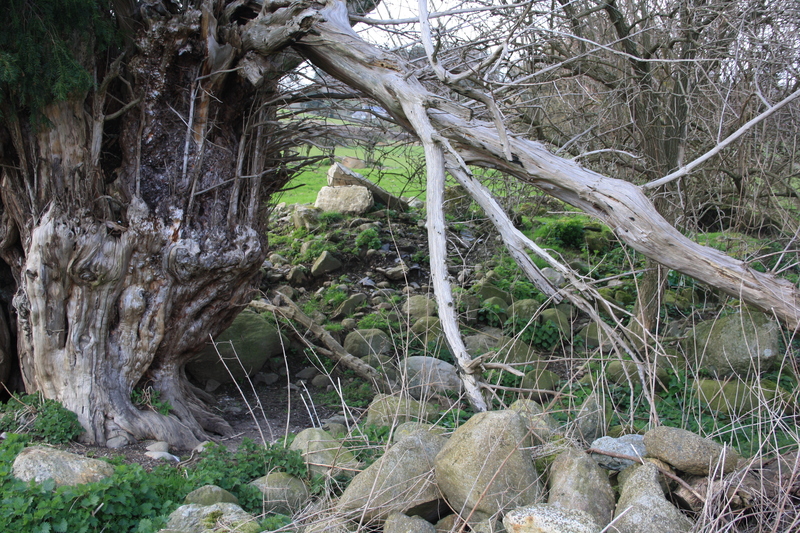 There is a well marked on the map in this location – is this the remains of Harris’s Well? Francis Jones(1954) Holy Wells of Wales. Cardiff University Press. H L North (1900) The Old Churches of Arllechwedd and H L North and H Hughes(1924) The Old Churches of Snowdonia. You have a very interesting site here! I used to live in North Wales and know many of these places. The old churches are lovely, but I am ashamed to say I haven’t visited many of the wells! We used to drive past Ffynnon Eidda, high on the moors above Ffestiniog – it was used as a drovers’ well for cattle but I am sure it has much older origins. Hello – thank you. Ffynnon Eidda has been on my to do list for a while now – it’s in a great location. I too know little of the history beyond its having been a drovers well, hopefully I shall find out a little more soon. I visited the site of Ffynnon Bedr on the 4th July 2015. 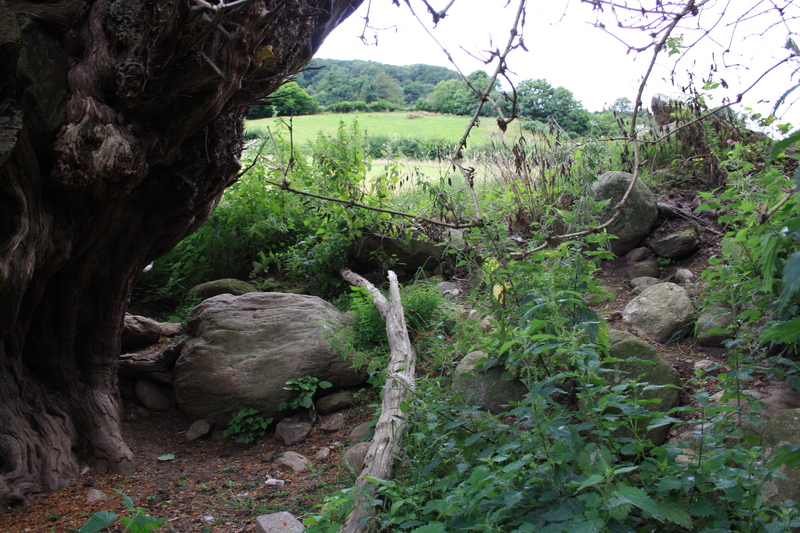 I could find no trace of water.The stones lie around the old Yew tree but are covered by nettles. The Yew tree has suffered large die back, but young shoots are growing up within the tree. The second well at Llanbedr identified in the photo was used by The Church Cottages as their water supply before mains was put on. A local man who was brought up in the cottages has kept the well entrance clear so it can be still seen from the road. Yes, I think it has definitely dried up. I first visited in the summer, and as you say, the nettles take over – the best time is in the winter, but even then there really isn’t a lot to see. Thank you for confirming that the other well was once used as a local water supply. I’m even more inclined to think that it is the one from the sketch in that case.